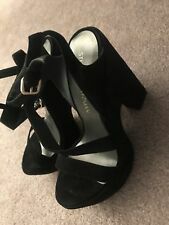 Stuart Weitzman Velvet High Heel ,Platform Shoes.Size 9. Great for fall/winter - black, velvet animal print Poco Pump with buckle and black patent heel. (Worn once). CONDITION: Excellent Condition. Only worn once. When you buy more than one item I will send an invoice with your total. These make any outfit stand out. Worn only once, so almost new! Original box included. As most Stuart weitzman shoes, these are very comfortable. Made in Spain. Brand new, never worn Stuart Weitzman black heels. Stewart Weitzman 2 3/4 Velvet Brown heels made in Spain in great condition sole is a little worn size 5M. Great find for New Year. Black velvet Stuart Weitzman pumps. These are a women’s size 9 and they are in excellent pre owned condition and have only been worn a couple of times. The only signs of wear are to the bottoms of the shoes. Perfect holiday party shoes! 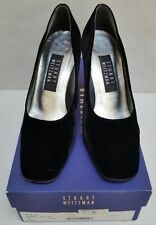 Stuart Weitzman Black Comfy Shoe Sz 8. This is in a good condition. Left pump has a small tear in velvet near toe. Insoles have scratches and creases. Soles show minor wear. Very soft and flirty heels by Stuart Weitzman. They are a combination of velvet, satin and golden fabric. The golden fabric shines against the dark velvet of the shoe. Heel is covered in satin. The soles show minimal wear and the fronts are missing the little crystals along with just a few blemishes on the golden colored fabric that you can see in the photos. Will require signature confirmation for delivery. Black Stuart weitzman with pearls. Satin upper. Any sole markings/wear is noted in the pictures. Price sticker and/or residue/marking may be present on the sole. Box may or may not be included (may not have a lid) and has shelf wear. STUART WEITZMAN. Block Heel Fringe Strap Sandal. Material: Velvet. and there is a mark on the velvet. their original box. They were a display. Uppers: Excellent. Don't miss out on these beauties! Stuart Weitzman 'Captain' Satin Ballerina Flats. Stuart Weitzman satin ballerina flat with fringe trim. Slip-on style. Round capped toe. We strived to provide a great buying experience. And we will fix the issue within 24 hours. Black velvet and gold lace upper. - Runs a bit small. best fits a size 8.5. I am cleaning out my closets and I have tons of great new and like-new clothing and accessories! - Appears to have been worn once or never at all. FW192 08/65. Heels = 4". Black Suede, Mid-Calf Boot, Back ZIP, Stuart Weitzman Size 7 1/2B! High style Black Suede Stuart Weitzman's 3" Stiletto boots are slightly worn but still worth it! The stiletto heels are showing wear, Inside the right insole tag with the designers name on it is loose, and can easily be glued back to the shoe if desired. And the toes are slightly scuffed. Please view all pictures for more details and email me with any questions you may have. I take special care with packaging all purchase. Exquisite Stuart Weitzman black velvet ballet flats with attached "flower" of black and grey suede. Stuart Weitzman black velvet heels. Made in Spain. Stuart Weitzman Brown Velvet Almond Toe Pump Stiletto Shoes Size 8.5M. Condition is Pre-owned. Shipped with USPS Priority Mail (1 to 3 business days). F63 10/23/18 SL. They are pre-owned in good condition. Soles show moderate wear. Insoles show moderate wear with creasing. Stuart Weitzman. Velvet and Leather. New without Box. Stuart Weitzmans high heels stiletto VTG light blue 6.5B 3" slim heels. Pair is in VG condition. It has a white stain in the front left that is visible in photo #5. Pretty pair of black velvet Stuart Weitzman heels. Size 8.5 M. Gently worn. Kept in a smoke-free, pet-free home. 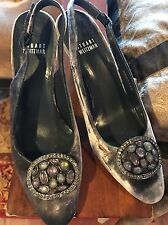 women shoes size 10 heels Black Velvet , Stuart Weitzman. Condition is New with box. Shipped with USPS Priority Mail. Black suede Stuart Weitzman Kilgore platform booties with round toe, elasticized black trim along ankle and heels. Shoes are in good condition with minor wear on the foot bed where the toes are located. For your consideration a beautiful pair of size 8.5 W Stuart Weitzman Black Velvet heels now available. The shoes are black velvet with black satin heels and Gemstones at the peep toes. They are in good to very good condition.